20018 AT-AT is a BrickMaster Star Wars set released in Nov/Dec 2010 with the last issue of BrickMaster magazine. This set is a redesigned Star Wars Mini model of an AT-AT. The AT-AT has four mechanical legs, a large squarish body, and a small rectangular head. The legs have three joints, one that connects the circular feet into the main body, one at the knee area, and one that connects the upper legs to the base of the body. The head is connected into the body by another joint piece, that can be used to move the head up and down. The head has four guns placed on it, two on the lower area, and one on each side of the middle section. AT-ATs (All Terrain Armoured Transports) were used by the Galactic Empire in their invasion of Hoth. 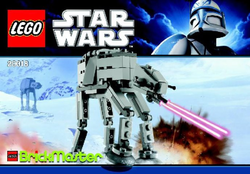 This set was the first BrickMaster AT-AT Walker released. This page was last edited on 15 March 2016, at 04:49.